I am a mother to two kids ages 15 and 9. My boyfriend has one son age 10. What do you consider the biggest obstacle you have overcome or your biggest accomplishment? My biggest accomplishment has been starting over after my last divorce and building myself up from sleeping on the ground of a shared room to having my own place that I can afford on my own. I have purchased two Target eCertificates, Red Robin eCertificate, fan gear mats, and have been scoping out some other much needed/wanted items as well. After moving to our home, finances were a little tight and we needed some essentials but payday was about a week away. I got a Target eCertificate so we could purchase those essentials. It really helped when we were down to deciding between food, gas or essentials. I was able to get essentials and food with the Target eCertificate and was able to get enough gas to get me through until pay day. I’ve had to do that twice but it was worth it. The repayment makes it effortless and so minuscule. It doesn’t hurt my budget. I love Zebit! So many items to choose from to help in a pinch. 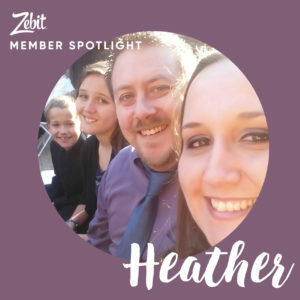 Heather received a $50 Buffalo Wild Wings eCertificate (her choice) for entering our Member Spotlight.